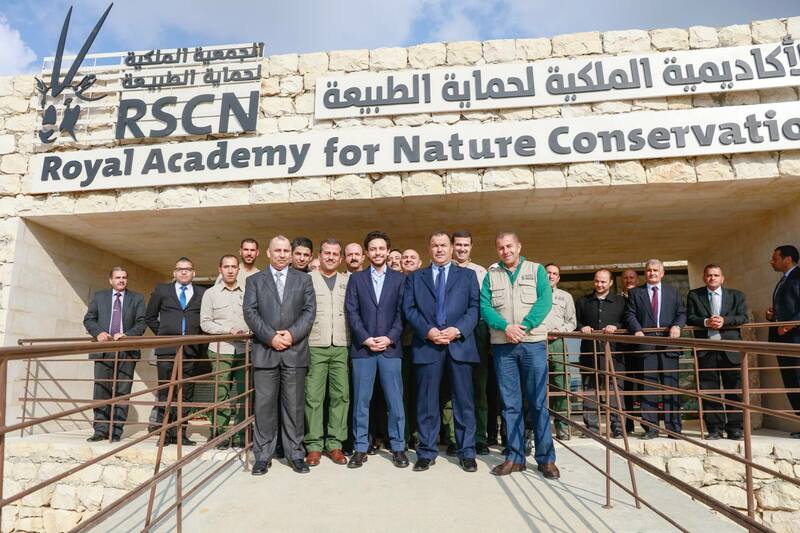 His Majesty King Abdullah II laid the foun­dation stone of a specialized Academy for training on the protection of nature and sustainable development near Ajloun Forest Reserve in 2010, and HRH Crown Prince Hussein inaugurated in 2015. The academy is “the first centre in the Arab world” specialised in offering training on nature conservation. The Academy constructed nearby the Ajloun Forest Reserve. It will be physically linked with the Reserve and its tourism facilities to create a single integrated eco-tourism complex. This will enable the Academy to use these tourism facilities as real-life training situations. Bathrooms – and a small spa, using recycled treated water, for use by Lodge guests at an extra fee. Trainee accommodation, designed to accommodate up to 20 students, two per room, with common room for out of hours recreation. Rooms to be built ‘hotel style’ so that students can practice housekeeping duties and cleaning rotas like a real lodge. The type of programmes to be offered will include: training for eco, nature and adventure guides; survival skills, search and rescue skills, eco-lodge management, sustainable tourism practices, eco-business development, 4 x 4 driving, outdoor catering, menu creation, first aid and emergency treatments in remote locations, ranger training, environmental policing and inspection, customer services, developing forest tourism packages, wildlife identification, geology and landscape, nature conservation and local community development. To construct an international-standard academy and ‘centre of excellence’ in Ajloun for eco-tourism and environmental ranger services in order to meet the national and regional requirements of the tourism industry and environmental agencies and create significant career opportunities and socio-economic benefits the people of the Ajloun. Minimum of 100 people trained each year to meet market demands in eco-tourism and environment-related disciplines, including: eco and nature guiding, ranger services, search and rescue, field craft and survival skills, , eco-lodge management environmental good practice for hotels and campsites, environmental monitoring and policing, environmental planning for tourism facilities, etc. It is important to stress that the main training approach will be one of intensive coaching to produce high quality candidates for the market – hence the “Centre of Excellence” label. It will not, therefore, be attempting to process large numbers of students each year. A range eco-tourism experiences and facilities created in the Ajloun District to support the Academy’s training programmes. These would include hiking and biking routes throughout Ajloun and beyond, camping and cultural experiences, bird watching facilities and archaeology programmes. All these facilities and services would be used by the trainees in the Academy to develop their knowledge and skills in relevant eco and adventure tourism operations; and, as viable commercial enterprises, they would also provide jobs and revenue for local people. A yearly programme of seminars, short courses and mini-conferences, bringing in visitors to Ajloun who will contribute to the local economy through the use of local services and amenities. National and international recognition for the Ajloun Academy as a centre of excellence for eco-tourism and environment related services, giving the area a much needed boost in prestige and local community morale. In the National Tourism Strategy, 2005, eco and adventure tourism are two of priority niche markets for Jordan. It states clearly that “landscape, seascape, climate, flora and fauna and other natural attractions are a strong feature of Jordan’s boutique positioning”. On the ground, new eco-tourism facilities and resorts are planned for Dibeen, Ajloun, the Dead Sea and Wadi Rum and RSCN itself is currently working on a 5-start eco-lodge scheme for a new protected area south of Petra. These and other future ventures will undoubtedly create job opportunities for people with relevant training and experience. Furthermore, Jordan is committed to “developing a sustainable tourism economy” and recognizes the need to build expertise in the environmental planning and management of tourism sites and facilities. By the year 2010, Jordan predicts an increase of 91,700 new jobs in the tourism industry (direct and indirect) and clearly a significant proportion of these jobs will be required in the growth areas of tourism, including eco and adventure enterprises. RSCN itself has experienced difficulty finding adequately trained staff for its eco-lodges and nature guides and, while it has invested in training for local people, replacing staff that leave is a persistent problem. The proposed Academy in Ajloun, by concentrating on excellence and practical work experience in the Ajloun Forest Reserve, would make a make a significant contribution to supporting these recommendations. The Ministry of Environment has recently partnered with the national police force and other agencies to create a national environmental policing and ranger service and estimates 900 job opportunities within the service over the next 3 to 5 years. It also predicts a rising demand for environmental inspectors to monitor and regulate key aspects of environmental quality in support of current and proposed environmental legislation. These aspects include air and water quality and domestic and hazardous waste disposal. The Ajloun Academy would be the only facility in the country to provide quality training in these areas of work. Also, the headquarters of the Environmental Police is to be based in the City of Ajloun and the Academy will provide a training base for their officers “on the doorstep”. Jordan is seen as a leader in the region in eco and adventure tourism and RSCN is currently assisting Syria and Lebanon to develop “Dana-like” enterprises in areas of high ecological value. There is little doubt that major growth will occur in neighboring countries in these areas of specialized tourism and demand for Arabic speaking experts and practitioners will likewise increase. For Jordan to retain its regional lead and influence through a Centre of Excellence for Eco-tourism will bring many benefits in terms of regional job opportunities for Jordanians and the potential to offer training programmes for practitioners from the region on a fee-paying basis.